Mrs. Goldie Steinberg was five years old when the second of the infamous Kishinev pogroms took place in 1905. She doesn’t remember the actual pogrom — which soon became an international symbol of Jewish suffering in the Russian Empire — but she does remember her family discussing it. Mrs. Goldie Steinberg was born on October 30, 1900, in Kishinev, then the capital of the Bessarabia region of the Russian Empire, and now the capital of Moldova. In 2004, at the age of 104, she moved to Grandell Rehabilitation and Nursing Center in Long Beach, New York, where she currently lives. Mrs. Steinberg’s age has been verified by the Gerontology Research Group and she is listed today as the 14th oldest person in the world. When I entered her room, she had just gotten her hair done by the beautician who comes to Grandell once a week, and was reading the New York Post. 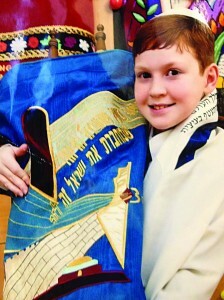 Mrs. Steinberg’s great-grandson at his bar mitzvah. Mrs. Steinberg was one of eight children born to Chazkel and Devorah Garfunkel. Mrs. Steinberg’s son, Don Sargent, says that his grandmother Devorah passed away when Mrs. Steinberg was young, but that she always had fond memories of her father, Chazkel. “Her father was a pillar of the community,” says Don. Life was grim for Jews in Russia before World War I, but the war exacerbated their already trying circumstances. In 1917 the Russian Revolution began, and Kishinev became a part of the Kingdom of Romania. 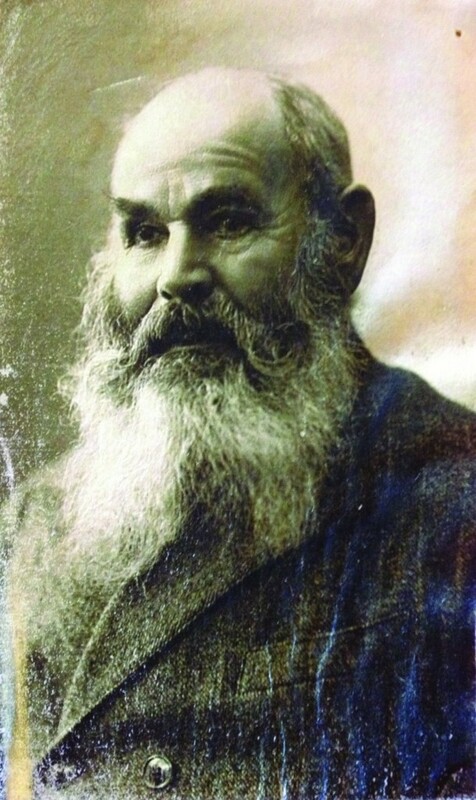 With borders and governments changing so rapidly, an uncertain future faced the Jews of Kishinev. Chazkel Garfunkel’s brother Max lived in New York (“He’s not alive anymore,” Mrs. Steinberg adds), and in 1923 she and two of her sisters, Raizel (Rose) and Sura (Sarah) arrived in America, never to return to Europe. 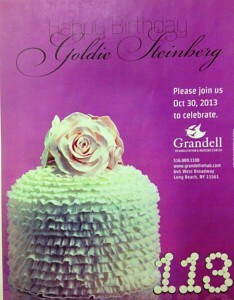 The sign posted about Mrs. Steinberg’s birthday party, to take place today. Although she didn’t know English, Mrs. Steinberg knew math quite well from her education in Russia. “My father was good at math; our whole family was good at math. My son is an engineer, and two of my grandsons are CPAs,” she says, with a look of pride on her face. In America, Mrs. Steinberg and her sister lived with their uncle and aunt in Bensonhurst, Brooklyn, and she found work as a seamstress. She married fellow immigrant from Kishinev Philip Steinberg in 1932, after meeting him at a social organization for immigrants from Romania. They had two children: a son, Mr. Don Sargent, and a daughter, Mrs. Ann Teicher. Mr. Philip Steinberg, who worked as a jeweler, passed away in 1967. Mrs. Steinberg continued working as a seamstress from home, helping to support her family, until she was 80 years old. “She was very talented at it, sewing children’s clothing, and drapes for an interior designer,” says her son Don. Crocheting is still one of Mrs. Steinberg’s favorite activities. Don explains that in their six-story apartment building in Bensonhurst, where his mother lived for 72 years, she was always regarded as the matriarch of the building. Each year around the time of her birthday, Don and his sister Ann are contacted by former neighbors who share with them some of their fond memories of their mother, and extend their best wishes. 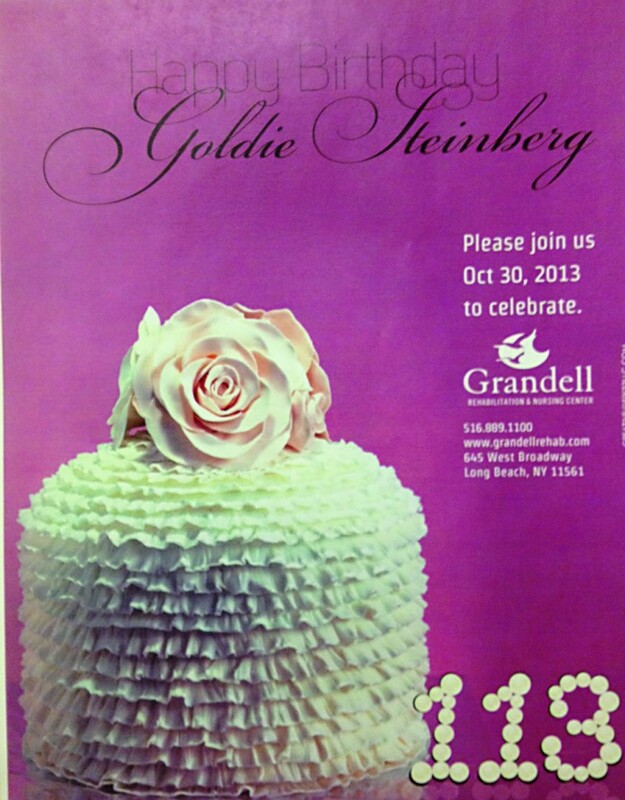 At Grandell, which is a strictly kosher facility certified by the Vaad Harabbanim of Queens and has a mashgiach temidi, Mrs. Steinberg’s kindness is well-known amongst the residents. Staff members warmly tell the story of how one night, not too long ago, Mrs. Steinberg’s roommate started coughing at around 2 a.m. As she coughed, the woman saw Mrs. Steinberg turn the light on by her bed, grab her walker, and come around to where her neighbor was lying. Working in America, Mrs. Steinberg saved up money and sent it to her youngest brother, Binyamin, still in Europe, who used it to procure a hard-to-get ticket to Palestine, thereby avoiding the Second World War. After the war, Mrs. Steinberg learned that her second-eldest brother, Mordechai, had survived the Holocaust and had made his way to what was by then known as Israel. Around that time, after not having seen each other in decades, Mrs. Steinberg traveled to Israel to reunite with the brothers she had thought she would never see again. But the most important lesson, she says, at the conclusion of our interview, is to be a kind and honest person, like her father was. “A person doesn’t take anything up with them,” she says. “All that is left is their good name. “My father was a good man, a warm man. He went to shul, and he would give tzedakah. The rich men in shul would ask him how much he was giving to tzedakah, because they were richer than he was so they had to give at least as much as he gave. Everyone knew that Chazkel was a good, Yiddishe mentch. This article appeared in print on page 1 of the October 30th, 2013 edition of Hamodia.